Well, it happened again. And again, actually – I’ve really had a spectacularly successful run of collecting tickets over the last three weeks, totalling six tickets. That’s about $400 in fines (assuming the ones I contested for various reasons are upheld). But the one that I was going to write about didn’t happen on Pyrmont Bridge, and is notable as it’s the first ticket I have ever received from non-cycling cops. Indeed, it’s the first time in my life I have been pulled over by a police car, complete with flashing lights (no wailing sirens, unfortunately, although I like to think they just forgot to turn it on). As is usually the case on these occasions, they were very nice, and listened politely as I explained my reasons. The female officer told me she would have to look up my record and decide whether to give me a ticket or a caution. I did ask for a caution, but did have to wryly admit that she was going to find a lot of helmet offences on my file. Whilst she was taking down my details, I had a nice chat with the other (male) officer about fixed gear bikes; he asked me how it rode and why I liked it. He was a cyclist, as it turned out, and we have a very nice chat. I’ve had a bit of a bad run of it lately. 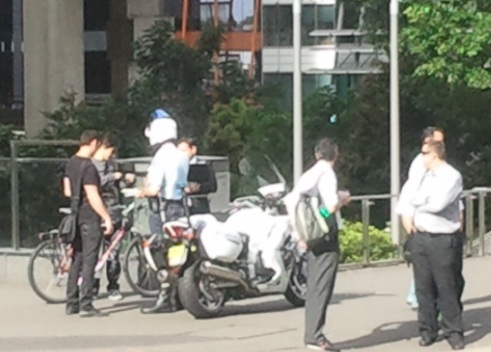 The bike cops are doing another helmet blitz on Pyrmont Bridge, and I’ve been stopped three times in the past couple of weeks. 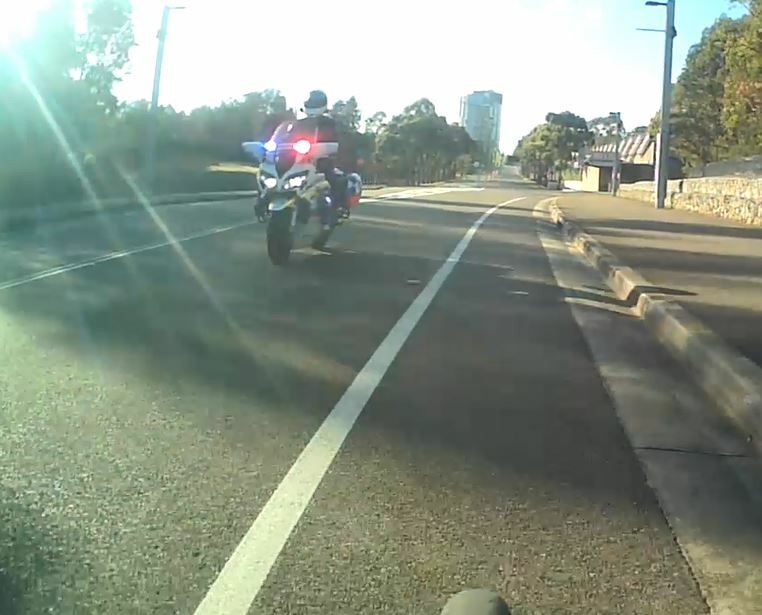 Had a lovely chat with them, but each chat costs me $66 – this the penalty in New South Wales for the heinous crime of riding a bike slowly in an area with no motorised traffic whilst wearing an ordinary hat. Whilst I have no argument with the individual cops (they are doing what their command have told them to do, and it’s obvious they think it’s a waste of time), one of the things that does bug me is that there are so many better things they could be doing. Like looking out for the kind of driver behaviour that actually puts cyclists at risk. Bike cops would be perfect for this – very easy to keep up with cars in peak time traffic, and then pull them over when appropriate. But no, their commanders seem to think that bike cops are only useful for policing people on bikes. 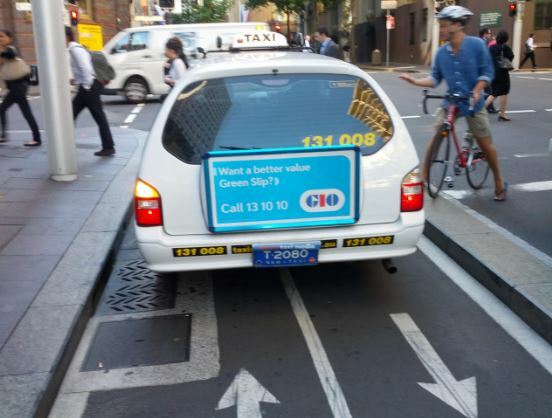 I was reflecting on this on the way to work when I came across a taxi driver merrily driving up the King St bike lane. He’d dropped someone off, but why he felt he need to drive in the bike lane to do so I have no idea. It’s illegal, inconvenienced a whole bunch of cyclists and is potentially dangerous. I took several pictures, and was thinking ‘where are those bike cops when you actually need them!’. Their eyes rolled a little (this must be an occupational hazard for policemen), and asked me to explain. I pulled out my phone, and showed them the pictures of the taxi I had taken that morning. To their credit they were very interested, asked me to email them the pictures, if I had a description of the driver and so on, and if I would be happy to be a witness if it went to court. I agreed, and thanked them for their time. They then rode away. Possibly because they had other matters to attend to or perhaps – I like to think – so that I could get back on my bike to continue my ride without the embarrassment for all concerned of either watching me hobble up the street in my bike shoes or having to come after me to give me another ticket. And I’ll wait to see if I hear back from them about the taxi driver. I hope they throw the book at him!! It seems there is a crackdown going on. 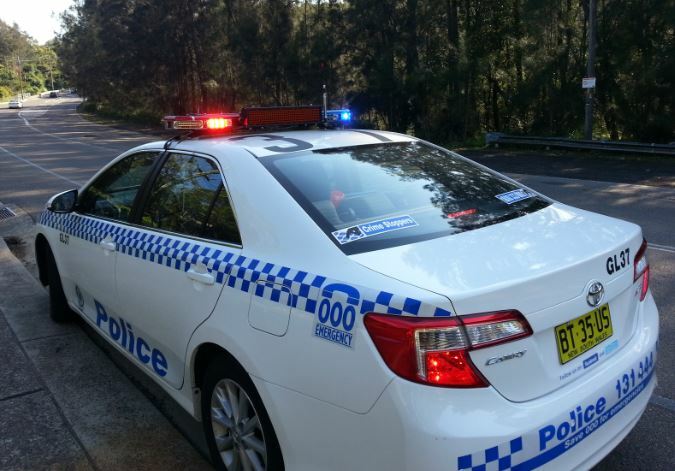 Right across Australia, police are focusing on vulnerable road users. ‘Hurrah!’, I hear you shout. About time some focus was put on behaviors that put vulnerable road users at risk. Surely this means an increased focus on cars that go through red lights, pass cyclists aggressively, mobile phone use whilst driving and so on. Unfortunately no. What the ‘focus on vulnerable road users’ entails is dishing out tickets to vulnerable road users for minor infringements that put no-one at risk, whilst ignoring the ‘bull’ – car drivers swishing past, ears glued to their phones whilst they exceed the speed limit. 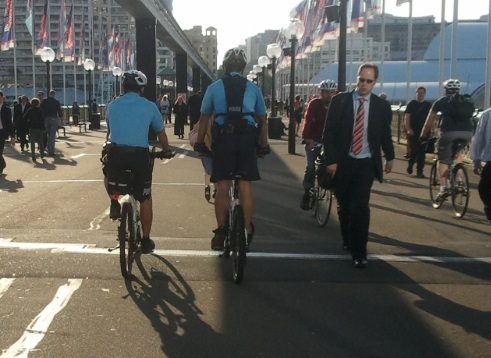 I saw the bicycle cops were on Pyrmont Bridge this morning, so I turned off to go another way. I could do without any more helmet fines right now, given that I just received a $198 bill for the last one (I appealed for leniency, but to no avail). However, on a very quiet back street I encountered another officer. I’m not sure if he was just sitting there to nab people going around, or if he saw me turn off prior to the bridge and rode after me. It’s one of the guys I know well, and he was very apologetic; he asked to to understand that it wasn’t personal, but they had been told not to issue any more warnings. He’s a really nice guy, and seemed to tacitly agree that the law was stupid – I also made the point that I appreciated his polite and professional manner, and that my argument wasn’t with him or his colleagues, but with the stupid law. So I continued to work (he was quite happy for me to continue my ride). Turning into the Kent St cycleway, a motorcycle cop shouted to me. Given that this wasn’t an instruction, I ignored him and carried on. Next thing he’s powering up alongside me on his motorcycle, shouting at me to get on the pavement and get off my bike. He was very rude, at least to start with, asking me why I didn’t get off and push, that he wasn’t wasting his breath shouting for no reason and so on. He was really quite aggressive. I thought the police were supposed to keep situations calm, not insult people and shout at them. Anyway, I was able to calm him down a bit by telling him I hadn’t understood he was giving me an instruction. Whilst he wrote me a ticket, I explained my reasons for not wearing a helmet. We had the ususal too and for about ‘the guys in the tour de France wear them’, to which I replied that drivers at Bathurst wear four point harnesses and flame retardant suits, but that didn’t mean they were needed for driving in the city. ‘But they are doing 200kmh!’ he said. So I pointed out the TdF riders were doing 80kmh down a mountain, whilst I was doing 15km/h in a bike lane – thus rather proving the point. His attitude did soften a a bit after that exchange, and at the end he simply advised me to wear a helmet, ‘to make your life easier’. He also commented that he had already pinged three cyclists and two pedestrians that morning. After he left, I watched him for a few minutes, and in that time he gave a pedestrian a ticket for jaywalking, and another ticket to a helmetless cyclist. Such a great use of our tax dollars. So it happened. 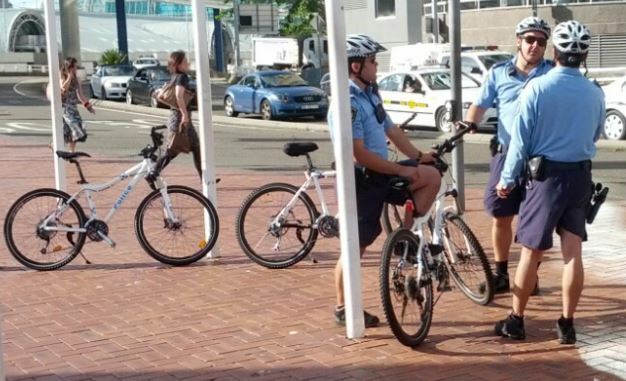 The ink was barely dry on the verdict I received when attempting to defend riding a bicycle without a helmet when I saw the cops again on Pyrmont Bridge. I rode along behind them for a while, wondering what to do. Get off and walk? Stay behind them and hope they didn’t see me? In the end, I had to know what would happen. Would they finally leave me alone, having seen that I was prepared to fight this, and having heard the magistrate uphold my arguments (if not the technicality of my legal position)? Or would they simply see that ‘I lost’, and dish me out with more tickets? So I rode past them, and sure enough they called me over. It was immediately clear that it was the latter course of action they had in mind. ‘So the magistrate didn’t agree with you then,’ one of them said. ‘Well, we have to keep giving you tickets’, he said. So they did. This is really getting very tedious; I have received eight tickets for riding without a helmet in the last nine months – this is after three years of riding helmetless without so much as a comment. So what to do now? Another court challenge? It all started back in January when I received a ticket for riding without a helmet. Then I got another one. After some umming and ahhinh, I decided to contest them – I just wasn’t prepared to be branded a criminal for doing something that harms no-one, and delivers benefits to society. So yesterday I had my day in court. Going to court involves a lot of hanging around, but my case was finally called and I went to the appointed courtroom at the Dowling Centre. It was a small courtroom, and the only people there were myself, the prosecutor and the court clerk. Whilst waiting for the magistrate the prosecutor and I got chatting, and it turned out he was a cyclist too, and he commuted in from Gordon each day. All very jolly. Then the magistrate arrived, and we were off. The prosecution outlined the evidence (essentially just the citations I have been given), and the magistrate turned to me. ‘I assume you are going to plead guilty?’ she said. I shook my head. ‘I am pleading not guilty, your honour’. As she was saying this, she began to put in what appeared to be a pair of iPod earphones. Now it was my turn to be taken aback. Was she going to listed to some funky beats whilst I gave my evidence? She then directed me to speak into the microphone, so I assume that in fact she was somewhat hard of hearing, and was using the earphones to hear me clearly. I had to pledge to tell the truth, the whole truth, and nothing but the truth, and then I was invited to begin. As you might expect, I was a little nervous. I had written out what I needed to say, but didn’t intend to necessarily read it verbatim. However, this is what I started to do to cover my nerves. I had barely got out a sentence when the prosecutor stood up and called ‘objection!’. Ooooh, how exciting! It was just like on TV. He objected to me ‘reading a prepared statement’. His objection was upheld, and the magistrate ordered that I turn my notes over and proceed without them. I was temporarily floored. I was very familiar with the material, but for a few moments flustered a little getting back into my stride. On reflection, I think this was a little unfair. It was my first time in court, defending myself, using a defence based on a relatively technical legal argument. And I was not permitted to use notes. Telling me not to read, well, perhaps. But not allowing me to have my notes in front of me? I continued, and after a few fluffs the argument began to flow. I explained I would be using the defence of ‘necessity’, and explained the three elements that it was necessary to show for this defence to be upheld. 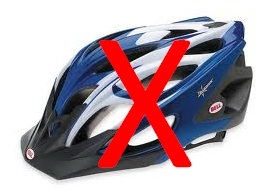 The first item was my belief that wearing a helmet puts the ride at increased risk of serious injury. I pointed out that there was significant scientific research on the subject, published in peer-reviewed journals that supported this belief. Half way into making this point, I was interrupted by the magistrate, who pointedly told me that I couldn’t use this argument in my defence unless the author of the research was there to support it. We had a bit of too-ing and fro-ing about this and the matter of whether talking about Sue’s court case was relevant, but when I was able to get a word in edgeways I explained that I was not attempting to conduct an examination of the science, but that the defence of necessity merely requires me to prove that I hold the belief on reasonable grounds – and that the very fact that there was peer-reviewed science to support my position was indeed reasonable grounds. I managed to land this point quite well, and it did cause the magistrate to pause, and then accept the point. However she then instructed me to move on to the next point, so I was unable to explain the relevance of the judge’s comments in Sue’s case – essentially that it seemed reasonable to me to take the same position as a District Court Judge who had previously examined the evidence. So we then moved on to the second item; that of necessity. The magistrate got very hung up on telling me that ‘this cannot be about you riding a bicycle’, which was kind of odd given that the entire case was about me riding a bicycle. I made a few salient observations about the necessity to ride to safeguard my health, and then was again hurried onto the final point, meaning was unable to make the argument about the need to reduce my carbon footprint. The final point was to demonstrate that no harm was caused by me breaking the law. I commented that no harm had been caused by me riding, and indeed a number of benefits had been accrued, such as benefits to my health, and to reducing congestion. And that was that, I was stood down from the witness box, as the prosecution had no questions. I must admit, I struggled to keep a straight face through this. The irony of the matter was stark; I was the one with the rationally held beliefs, based on a long and careful study of the science, and yet apparently the opinions of a magistrate with no expertise in the matter at all were more valid. I wonder if she knows that she is essentially calling her learned colleague Judge Ellis ‘irrational’ and ‘ridiculous’, as after considering the evidence he too came to the conclusion that wearing a helmet was more likely to do harm than good. She also rambled on about how injuries do cause a cost on society, and she did therefore not accept my argument that no harm was caused. This reflects her incorrect grasp of the law; the defence of necessity only requires that no harm was caused on the specific occasion under consideration (which in this case can be shown, as on that day I caused no harm by riding my bike), however she took the argument to the general case that riding without a helmet may, at some point in the future, cause harm. The one part of my argument she did not comment on was the point of necessity – the argument that I had to be riding my bike on that occasion. This was by far and away the weakest part of the case, and one on which I think it would have been quite easy to dismiss the argument. After heading her speak, I was braced for the verdict. A large fine? Or perhaps slugged with court costs for wasting her time? However, at the very end of her speech, her tone changed slightly. She warned me that ‘this is not the right way to go about this matter’; she made the point in a rather oblique way and I found it hard to really follow the point she was making. However, it occurred to me that she was aware this was as much a political argument as a legal one, and was acknowledging that – if also trying to warn me off using the courts as a way of grandstanding the issue. She summed up by saying she accepted the offence and that the law had been broken. And then she noted that on this occasion she would record a non-conviction, and that I was free to go. Slightly gobsmacked I left the court – no criminal record, no fine. Did I win? Well yes, I suppose I did, but the whole thing just left a sour taste in my mouth. I had spent a long time preparing my arguments, and was frustrated that I had not been given room to make them. And I was annoyed by her holier-than-thou attitude on a matter about which she knew nothing. I left the court and jumped back on my bike to ride home. The sun was shining, and I rode along upright and resplendent in my best suit. On the way home I passed a film crew filming cyclists passing on the Union St cycleway. I was curious as to who they were, so turned around and cycled back towards them; as I reached them I heard someone shout ‘cut!’. They explained that they were making a promotional item on the City of Sydney cycleways to be aired in local cinemas.